Often, folks end up eating at fast-food chains and staying in chain hotels while on the road. Hey, I've done it, too. But I wanted to take a few moments today to bring your attention to some family-owned independents we've found on our travels. They don't have national ad budgets, or widespread name recognition, so you've probably never heard of them before. But I can endorse them all, and hope you'll give 'em a try if you're ever in their areas. I love supporting locally-owned, independent establishments. As someone who owns and runs a couple of independent websites, I feel good about supporting people who are running their own businesses. And I usually find the quality of food and service superior in local, independent shops, as well. If there's one piece of advice I can give you in finding these indie gems, it is this... make your roadtrip stops in college towns. College towns support a wider variety of businesses than you'll find clustered around random Interstate interchanges. Don't let the name turn you off, this is quite a family-friendly hotel, with comfortable rooms at reasonable prices. It's new, just opened within the last year or so and the only knock I could put on this place is the "new carpet" small. (Which I hate.) But, hey, it beats the musty, smoky, doggy smell that I've found at waaay too many hotels across the country over the years. I don't stay anywhere without WiFi (otherwise, you don't get site updates), and the Wine Country Inn's was just the way I like it: unlimited, fast and free. There's a good free hot breakfast and cook-outs many weekend nights. Set amid vineyards and orchards on Colorado's western slope, the only thing this hotel is missing is a great chef-driven restaurant. But give this place a little time and support and we'll see how it grows. Reading Eric Schlosser's Fast Food Nation reinforced my desire to avoid the Frankenfood served up by almost all fast food chains. (I haven't eaten at a McDonald's in more than nine years.) 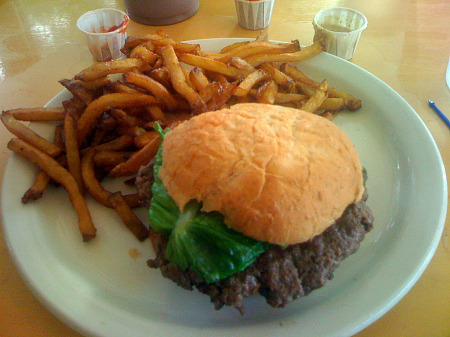 Local Burger is everything a hamburger joint ought to be, serving locally grown, organic meats and fixins. I had a bison burger with the best stone-ground mustard I've ever tasted. Portions might seem on the small side, but don't be fooled - food of this high quality is quite filling. But skip the fries in favor of the applesauce. The fries aren't as crispy as I would like, but the applesauce is a cinnamony delight. It ain't cheap - six bucks for a burger, but your stomach, and your conscience, will thank you for spending the extra couple bucks for a good meal. Laurie loves her coffee in the morning, and found this great alternative to the ubiquitous Starbucks. La Prima Tazza brews up a wild assortment of morning beverages - everything from a great latte to some fun iced drinks. Natalie loved their take on a New York egg cream. Service is engaged and attentive, and the quality of the baked goods a pleasant bonus. 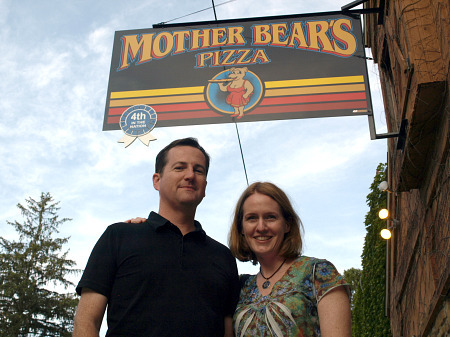 Okay, I've been going to Mother Bear's for years. But I was relived to find that it still offers the same, rich, tasty pizza that I loved as a student. Start with an order of breadsticks and spicy cheese dipping sauce, then get one of Mother Bear's traditional pan pizzas. Just go for a size smaller than you would for a hand-tossed pie. Mother Bear's piles on the cheese, forming a cripsy, browned cheese crust along the edge of the pie. Just. Kill. Me. Now. Laurie's old choice for coffee in Bloomington is long gone. (And frankly, it wasn't that good.) But she was very pleased with the Pour House, a comfortable shop on the main Kirkwood strip. We both enjoyed the "Canadian Polar Bear" (espresso, milk - I chose soy, maple and white chocolate). Laurie had her's hot, mine was over ice. There's a large map on one wall, pointing out some of the places that the store's sent its daily profits to support charities around the world. It supports local causes as well, with money going to buy school supplies for local needy kids, too. If you are a theme park fan who likes to support family businesses, Holiday World is, of course, on your to-do list. I have to complain about one thing, though. Holiday World's free drinks and free parking have spoiled me forever, just like front-of-the-line access for Universal Orlando hotel guests did for me last summer. I winced every time I paid $3.50 for a drink at Kings Island this week, thinking fondly of Holiday World each time. Which, of course, is just the way Holiday World planned it. Hey, folks who run their own businesses can be pretty smart. July 23, 2009 at 11:11 AM · Good article. "Portions might seem on the small side ..."
Uhh ... maybe it's light diffusion, but that burger looks pretty huge. "It ain't cheap - six bucks for a burger ..."
Damn, I hate Canadian prices. Our McDonald's restaurants charge $6 for the burger itself, and usually a fast food restaurant meal runs me just over $10. I'd like to see an article about local favorites in Orlando. There are a few in The Unofficial Guide and other guide books, but I want to know what the readers think. July 23, 2009 at 1:01 PM · Like Holidayworld (yet to visit), I like parks where the food is quality then I don't have to hunt around. This is one of the reasons I LOVE Kennywood in Pittsburgh so much. The food is quality and has reasonable prices. There is just a lot of love there. Also as larger parks go, Buschgardens Williamsburg has great food places. Some locals have season passes just to go to dinner there. (Cowichan Bay, BC, Vancouver Island) The restaurant atop the Oceanfront Grand Resort & Marina has the BEST Sunday brunch we've ever gone for. $20 CAD per person gets you full access to an amazing array of breads, meat, fish, salads and desserts, all locally made. If you go for the later slot (11:00 or so), you might get lucky and encounter the roasted 'purple majesty' potatoes. (Kent, Washington, downtown) Spiro's Greek Island. Little bitty hole-in-the-wall. You'd never find them unless you'd heard about them, but they've got amazingly good stuff at very decent prices, and live belly-dancing on Friday and Saturday nights. The souvlaki platter and gyros are both second to none. WARNING: The desserts reach a new level of 'decadent,' especially the baklava. (Oakland, California, near the Rockridge BART station if they still exist) Zachary's Pizza. Just go. You won't regret it. On another related topic, my lady and I have discovered that we greatly prefer bed-and-breakfast places to the standard hotel/motel. Usually much less expensive, and we have a far better chance of getting a comfortable bed (as opposed to something that feels like a new model of padded concrete slab). July 23, 2009 at 8:26 PM · I have not made it to Local Burger, but will check it out next time I am in Lawrence. Usually we hit the Yello Sub when in that area. Despite the fact that it has become somewhat of a local chain (Planet Sub), its roots are all in Lawrence. There really are a bunch of great places to eat in the Greater Kansas City area, some locally owned some not. Among the local joints you have Mugs Up Drive In, at least a dozen great BBQ places (Smokehouse and Jack Stack for sure), Stroud's, Jerusalem Cafe, La Bodega, Margarita's, Grinders, Genghis Khan, and Chartreuse Caboose to name just a few. For national chains there's places like Raglan Road, Houston's, McCormick and Schmick's, Cheesecake Factory, and all the best national chains. One thing KC really has going for it is restaurants! I guess we do like to eat here in the Midwest! Maybe because there's not much else to do? A couple of local options we hit recently in our travels were Bobo's Drive-In (Topeka, KS), which had some pretty good grease-based food, and Allins Diner (St. Charles, MO) which had the best burgers I have had in a long while. And just south of me in Branson at a little place called Silver Dollar City, well, there's some of the finest theme park food this side of Orlando! If you are in the area, definitely stop in for a few skillet meals and some homemade potato chips! July 24, 2009 at 9:13 PM · If you dont want to pay 13 bucks for pizza in Cedar Point, just drive on down to "East of chicago pizza" not even Five miles from the park entrance. A buffet and a drink is only 5 dollars, compared to the 13 dollars in the park (Taken from the pizzeria next to Maverick). While you are there, check out their crazy Peanut Butter and Jelly Pizza!